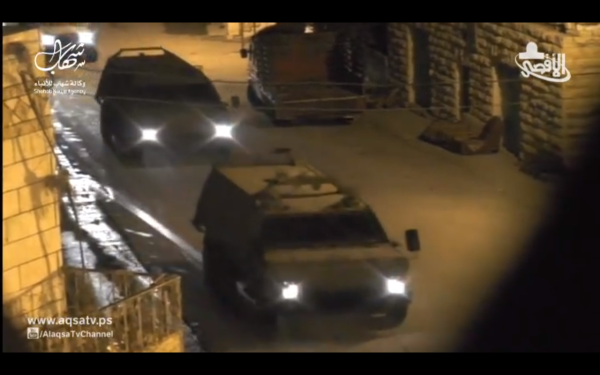 Early Wednesday morning, January 14, 2015, a massive deployment of 400 Israeli occupation forces invaded the village of Beit Ummar, north of Hebron. From 2:00 – 5:00 am, the occupation forces invaded approximately 100 Palestinian homes, arresting 25 males and leaving notices for 15 additional males to meet with the Israeli intelligence. 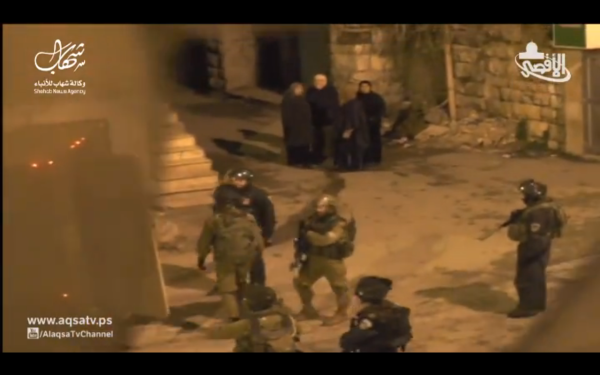 Occupation soldiers invaded the private homes with violent force, blowing open the front doors with explosions, ransacking the rooms, breaking the furniture inside, smashing windows, and attacking the residents. One of the victims of this brutal invasion was the family of 25-year-old Nidal Abu Maria. Nidal is the oldest son of Ahmed Abu Maria, who has been imprisoned for the last four months. According to the family, the occupation soldiers forcibly entered their home with large aggressive dogs, blowing the door open with explosives. Nidal’s mother, sister, and two brothers ages 6 and 7 were inside, and awoke shocked to find soldiers inside their home. The occupation forces locked Nidal’s mother in a separate room, away from her children, and took her phone, noting the family members phone numbers from it. The pregnant sister attempted to speak to the young boys, who were scared of the military invasion and their dogs, when the occupation forces violently hit her in the face and told her to keep quiet. 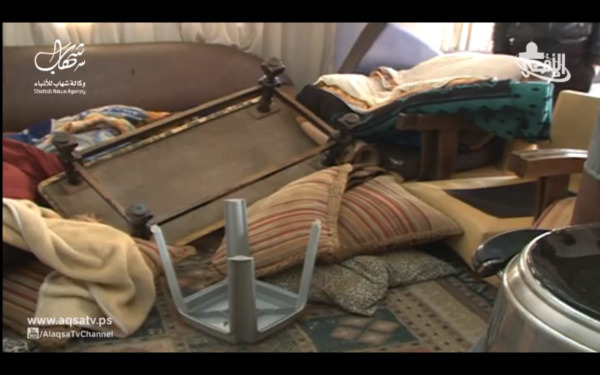 In addition to physical violence against the family, the soldiers also ransacked the home, destroying the windows, the furniture, and the entire kitchen. Nearly 99 other houses were also invaded this same night, and experienced the same destruction. During this brutal night invasion, 25 males were taken from their homes and arrested without any official charges or explanations. According to Ma’an News, those detained were as young as sixteen years old. The youths were not known activists nor had there been any protests in Beit Ummar since the massacre in Gaza for them to take part in. Five were released the next morning, while the rest still remain in custody. Additionally, the invading soldiers left official request notices for 15 residents of Beit Ummar to report to the Israeli Intelligence at the Kfar Etzion prison in the nearby Kfar Etzion settlement the following day. Nidal Abu Maria, along with his brother and cousin, were among those that were requested to report to Kfar Etzion. Nidal decided to not comply with the occupying army’s request, and did not report to the prison at9:00 AM on Wednesday as the soldiers demanded. However, after the occupation forces called him and his mother on the phone, threatening the lives of the family, he felt he had no choice. When Nidal answered one of the many phone calls from the military and questioned why he should follow orders from an occupying military, the Secret Service member told him, “I am the state of Israel, I am the one who has power, I am the law”. Nidal and his brother reported to the Kfar Etzion prison on Thursday morning and were interrogated for several hours by the Israeli intelligence. During the interrogation when the brothers were being questioned, they were told, “We want to make sure you guys are ok, and that you are doing the right things and not the wrong things.” Additionally, the interrogator told Nidal, “If you miss your uncle (the martyr), I will send you to him.” Nidal interprets this as a direct threat against his life. Nidal’s family is no stranger to such violence at the hands of the Israeli occupation. Nidal’s father has been detained and imprisoned eight times for a total length of five years – once on charges of organizing peaceful protests in Beit Ummar, while the other seven times were without official charges. Additionally, Nidal’s uncle Hashem Abu Maria was executed on July 25, 2014 during a peaceful protest against the 2014 massacre in Gaza. Hashem was shot in the heart by an Israeli sniper on the main street, while encouraging the children to go home rather than risk being hurt in the demonstration. Hashem worked for the Defence For Children International documenting child-rights violation in Hebron and according to Haaretz, this was the role that Hashem played in many protests. Nidal’s aunt, the wife of Hashem, has suffered greatly since his death, and even months later she is still afraid to sleep in the house without him. Ten days after Hashem’s assassination, the occupation forces invaded Beit Ummar and arrested Ahmed, Nidal’s father. He is currently still imprisoned and has not been officially charged with any crime. Despite not facing official charges, Nidal’s family is told that he faces three years in prison. In the year of 2014, over 400 residents of Beit Ummar were arrested and over 120 residents are still currently imprisoned, some without official charges. Additionally, 3 residents were killed during this time. When asked why Beit Ummar experiences such frequent violence at the hands of the occupation army, Nidal explains it has a lot to do with its location. “Beit Ummar is surrounded by three settlements: Migdal Oz, Kfar Etzion and Karmei Zur. The village is located close to the main road that connects the settlements from Bethlehem to Hebron. 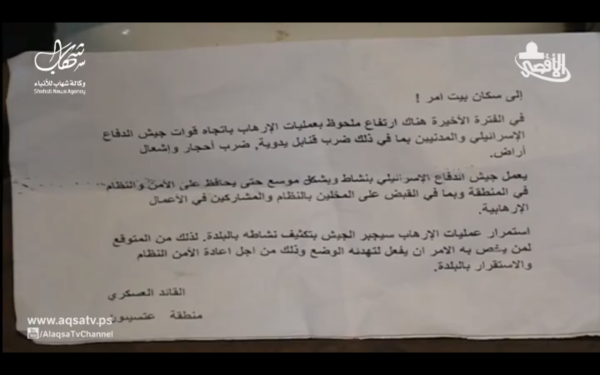 The official explanation from the occupation forces are that these actions are taken against Beit Ummar for ‘security reasons’.” These nearby settlements have confiscated nearly one third of the village’s land which is located in Area C. Additionally, much of the military violence against Beit Ummar can be attributed to their strong commitment to resistance against the occupation. Beit Ummar was the site of nearly two protests every week during the 2014 attack on Gaza. For residents of Beit Ummar the recent violence happens whenever there is a new commander in the area. Nidal explains that the commanders like to introduce themselves by sending a strong message to the local Palestinian population. The new commander in the Beit Ummar area goes under the name Abu Abed and is a former member of the Israeli Intelligence.